Refirme™ ST (Skin Tightening) is a painless, no downtime skin tightening treatment, which results in an immediate lifting and firming of the skin. This revolutionary technology combines radiofrequency (RF) and infrared (IR) light in such a way that they work on the skin simultaneously and synergistically, surpassing by far the benefit of each by itself. Refirme™ ST has quickly become a great favorite for my patients who want to have tighter and firmer skin on the spot, and do so without visible post treatment marks. How does it work? The RF (Radio Frequency) and IR (Infer-red) combine to generate energy which gently heats the deeper layers of the skin. The result is an immediate tightening of the collagen in the areas treated, showing on the skin as reduced sagging and a visible lift in the areas of loose skin. What is the long term benefit? The skin perceives the treatments as a sign of need to regenerate and rejuvenate itself, and starts producing new collagen, lasting for 6 months after each treatment. Collagen production shows up as a decrease in fine lines, firmer skin, decreased sagging, tighter pores and better skin quality all around. This is in addition to the firming effect due to the immediate tightening. Are the treatments dangerous? This is one of the safest technologies around. The technology is designed in such as way that there is no chance of the laser effecting unwanted areas of the skin, and can be safely used on all parts of the face (except the eyes which are covered with special goggles) and on the body. What areas can be improved with Refirme™ ST? Refirme™ ST can be used to gently tighten and lift the nasolabial folds, the jowls, upper and lower lips, elevate the eyebrows and by extension the upper eyelids, resulting in a more “open” looking face. The neck is a favorite area for many. Some patients like the treatments for tightening the belly button area, the inner thighs, the upper arms and around the knees. It can also be used it for acne prone skin to decrease pore size and stimulate collagen production to help diminish acne scarring. 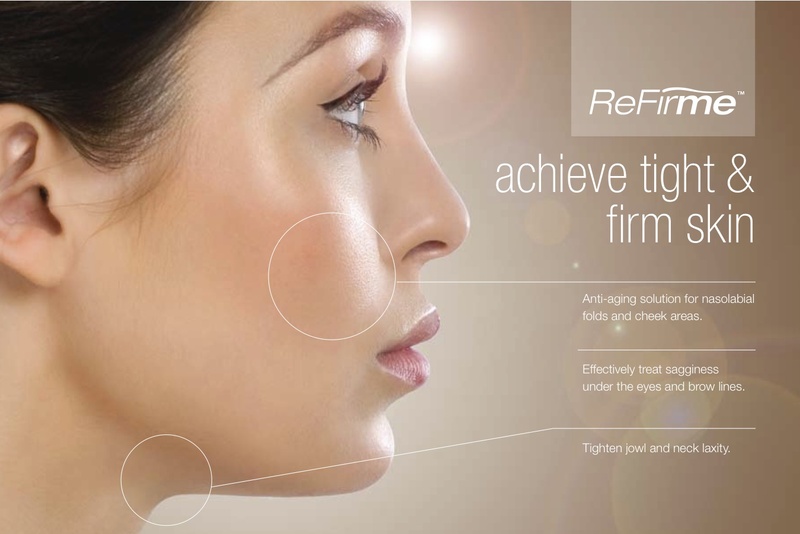 How does the Refirme™ ST compare with other skin tightening treatments? Refirme™ ST is a no downtime, painless procedure, using the so called bipolar technology of RF. What this means is that the distance that the RF can travel is predictable with great accuracy. This becomes important around the eye area, such as lower lids or crows feet, where it is important to know just how close to the eye the treatment can be safely preformed. Similarly, when treating the neck for a lift, it is important to know that the RF will not travel deeper than desired and result in uneven skin due to reaching the fat under the thin skin of the area. This is just the opposite of what has been seen over the years with technologies utilizing monopolar RF, such as Thermage. Monopolar RF is not limited in its ability to travel to a distance. The technology relies on dissipation of the RF energy by the tissues of the body. For this reason, it is hard to predict how far and how deep monopolar RF can reach, and what unwanted areas it can get to. The Titan technology uses IR without the RF. These treatments take a significantly longer time than those with the Refirme™ ST, and the immediate tightening effect is missing. The treatments in general are also more costly than Refirme™ ST.
Do I need anesthesia for the Refirme™ ST? No, absolutely not. Refirme™ ST is a gentle treatment, requiring no pain relief with topical or other forms of anesthesia. This is quite different from the Thermage treatments, which are rather unpleasant and are often not tolerated without the help of an anesthesiologist. This increases the cost, not to mention the risk. Would you recommend Refirme™ ST treatments for everyone? Any patient with minimal to moderate sagging is a good candidate. Everyone can benefit from the improvement in the quality of the skin resulting from the treatment. The only patients who are not good candidates are those with pacemakers, which would be negatively impacted by the RF. Everyone else is game.